Holiday season is approaching quickly, and I know we are all busy shopping for others instead of ourselves. 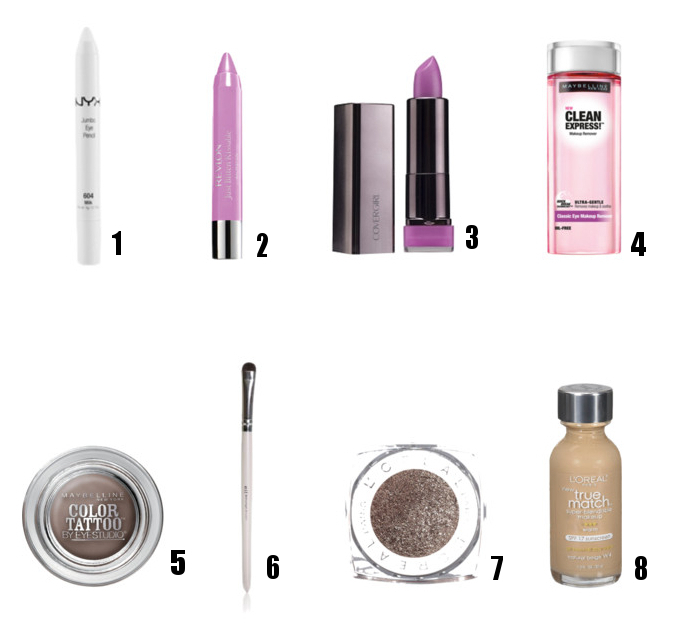 So, I put together a little collage of my favorite drug store products that will keep you looking great on a budget! First up, NYX’s Jumbo Eye Pencil in Milk. NYX is a great makeup brand that is affordable, but is also really great quality. Milk is a very pigmented, true white eye pencil that is great to use all over the lid as a base or even line your waterline with it to make your eyes appear wider, giving you a doll-like look– my favorite! The next two products are my favorite drug store purple-magenta lip colors. Revlon’s Just Bitten Kissable Balm Stain in Darling is great on so many levels; I am obsessed! The color, at first, seemed very sheer, but it is definitely buildable. The greatest part about this lip color, apart from the fact that it is a magenta color, is the stain that it leaves behind– it really looks like you were just bitten! It gives your lips a bitten red flush, which is amazing. The only problem I have with the balm stain is that after a while on your lips it begins to feel a bit grainy, which I hate, but the color and lasting effect truly makes it worth the 8 dollars. Then there is Covergirl’s lipstick in Divine. This is a gorgeously pigmented purple-magenta color that really suits medium, tan, or olive skin tones. The lipstick has average staying power and it isn’t grainy or too drying. Love, love it! One staple that every woman– especially one like me who wears a lot of eye makeup–should have in her collection is a good eye makeup remover. The Maybelline Clean Express Makeup Remover is a great affordable product– it is only five or six dollars, which is definitely a steal! I like to shake it up then pour some on to a cotton pad, rest it on my eye for a few seconds then wipe off all of my eye makeup. My eyes tend to hold product a lot, especially mascara and liner, so I then dab a q-tip into the liquid and run it along my upper and lower waterline to ensure all of the eye liner and mascara is completely gone. Another Maybelline product is their 24 Hour Color Tattoo in Tough as Taupe. This cream eyeshado w is around seven dollars, and if you do not want to pay for a high end cream shadow, this is a great alternative! Although it is advertised as lasting 24 hours, I would not go that far. It does last depending on how well you pack it on, but it does wear off after about twelve hours. This color, Tough as Taupe, is definitely one of my favorite colors right now. I just dab it all over my eyelid with my ring finger then smoke out the crease with a soft brown color; pop on some eyeliner, thick or subtle, and it is a beautiful, simple Fall eye look. Of course brushes are essential to creating a great makeup look, and Elf’s smudge brush is a great steal at just one dollar! I use this brush to smudge out shadows whether they be cream or powder, and it does the trick! Another great drugstore eyeshadow is L’Oreal’s Infallible Eyeshadow in Bronzed Taupe. This is a really great soft, silky, and smooth eyeshadow that I honestly cannot believe is only about seven dollars since it is so luxurious. This color is great for the Fall season especially if you plan on going out at night. Pop this all over your lid with a fluffy brush for a soft, subtle smokey look or pack it on with your ring finger for a more intense, dramatic look. Last, I love L’Oreal’s True Match Foundation and mine is in W5. This is a great foundation for any of you beauties that are on a budget since it is only around eight dollars. The foundation has a good consistency with medium coverage that is buildable. If you have a great blending brush, this foundation will look great! It lasts for quite some time and is not too matte nor too dewy– it is just right! I hope some of you try out these products, and love them as much as I do. They are definitely great for using every day if you are on a budget and want to get the best products for your money.